Grease-stained hands, deflated tires and broken belts are just a few images that come to mind when discussing mower maintenance. 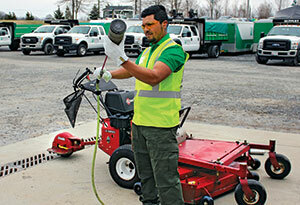 For many landscape companies, mower maintenance amounts to much more. 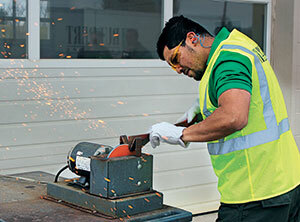 For companies that prefer to perform maintenance in-house, landscape pros offer up a few tips to get the job done — and get it done right. On whose shoulders does the task of maintenance fall anyway? Some landscape companies leave it up to the crews. For example, at Ruppert Landscape, crews are expected to spend additional time twice a week — once in the beginning of the day and once at the end of the day — to sharpen and check blades, check air filters and blow off machines, according to John Sawyer, regional fleet manager of Ruppert Landscape in Raleigh, N.C.
During the more in-depth maintenance session, which takes place at the end of the day, Ruppert’s crews are expected to do a more thorough inspection and catch any minor repairs that need to be handled. Greg Kaiser, operations manager of YardApes in New Milford, Conn., agrees with this approach. “Having crews involved in as much of the mower maintenance as possible is important because it gives them more of a responsibility for the upkeep and performance of the mower they’re using,” he says. In addition to having mowing crews perform maintenance, Ruppert has its in-house mechanics perform a winter reconditioning of all its mowers during the slower winter months. Other companies may opt to leave the crews out of it and only have a dedicated mechanic do maintenance. This is the case with BrightView, which employs one to two mechanics at each branch, according to Fisher. Because finding a mechanic may be difficult, Fisher suggests looking within the company’s own ranks. To document maintenance, companies can implement an hour meter on machines to determine how long it’s been since the machine was last serviced, log what type of maintenance is performed on each machine and, as one last fail-safe, physically mark filters with the date on which the machine was last serviced. Crews also can clean debris off of pumps and motors, keep a consistent set of parts on hand and be sure to use a tire pressure gauge when checking tires. “A lot of people just look at a tire, think that it’s low and put air in it without using a tire gauge, but they can overinflate the tire. Then they’ll bring the mower back later and say that it’s not tracking properly,” Sawyer says. Aside from the maintenance tricks, Fisher suggests contractors look into manufacturers’ trade-in programs, which allow landscapers to swap in their mowers every few years.